The language used to talk about cancer often focuses on battle words – those who are cured “won” or “survived,” while those who die from cancer “lost” their “fight.” But is cancer really something to be won or lost? Young adults with cancer discussed these phrases and others during the recent Young Adult Cancer Conference hosted by the Young Adult Program at Dana-Farber. Labeling your cancer, and yourself as a patient or survivor, is often one of the most challenging aspects of the cancer experience, they said. Loved ones and those without cancer often consider cancer patients “heroes,” but, as one young adult put it, “I don’t feel very heroic when I’m going through treatment; I just take my medications and do what I’m told to do.” Another young woman added: “The intention is, ‘you inspire me; it inspires me to watch you survive,’ but they don’t do a good job at expressing that.” Being labeled as a hero may put undue pressure on patients or make them feel like they aren’t allowed to look sick or express negative emotions about their experience. For many patients, there are also conflicting feelings about the term “survivor.” Some patients feel it is acceptable to use the word within a group of your peers who are also experiencing cancer. But when people who are not patients use the term, it can create a sense of “survivor’s guilt” for those who have had friends die from their disease. The word can also create anxiety for those who were cured or have no evidence of disease and may feel they have to act a certain way. These terms become even more complicated for those with cancers considered to be chronic, or for individuals whose cancer was cured or has gone into remission, but who still feel the emotional impact of the cancer experience. What do you think of the terms usually associated with cancer? 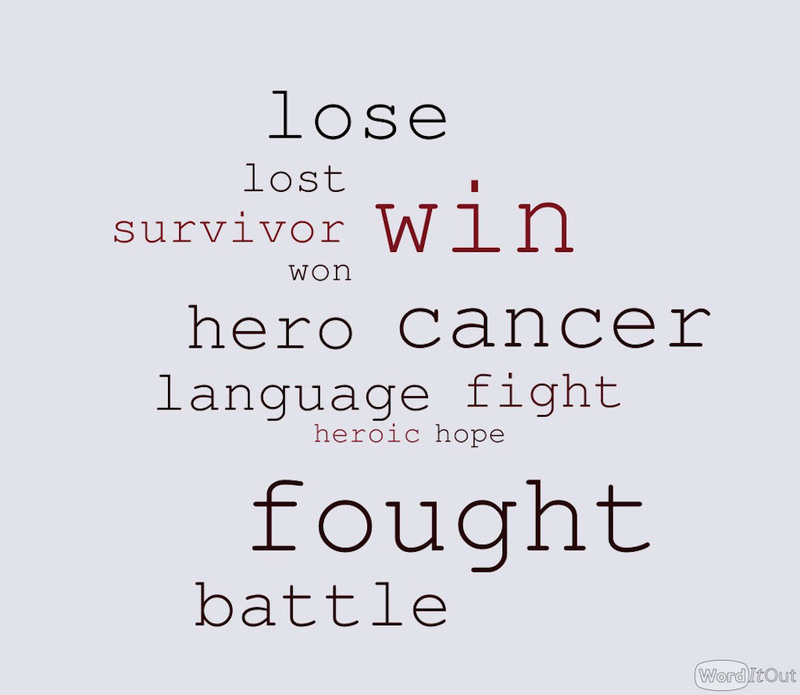 What words do you prefer to use for someone coping with cancer or who has finished treatment? Let us know in the comments section below. Never BELIEVED the term “survivor”, even though I am 14 years past treatment; one knows that the disease can reoccur, or one can get another cancer. This subject DOES need examination; all military terms must be removed from the scenario; however, for many, just surviving the treatments is heroic; wish there was simple wording to allow for all who have made it through the pain and drama of treatment(s). I like to think that “I am well, thank you!” is a good reply to those who need to always ask ex-patients how they are, if they are NED. Great points, Mary. Thank you so much for sharing and connecting with us. I feel the same way about the word survivor… Not trying to be negative about my cancer and remission, but how do really know if you are a survivor. I am only 1.5 years out from completing treatment for Colon cancer and everything is good so far, but it is always going to be in the back of my mind that I had cancer and here will be always be a chance that it could return. Thank you for connecting with us and sharing your experience and insight. We will be sure to check out your blog. All the best! – In our society, losing typically implies fault. Why is the patient faulted when they likely did everything to deal with their diagnosis? Why is the medical community never mentioned as losing their battle? – A cancer diagnosis is similar to being attacked from behind. If the person attacked gets “beaten up” it’s not fair to indicate they lost the fight. – I expect most people would not feel comfortable consoling a person grieving a cancer death (or by any other medical condition) by saying, “I’m sorry your loved one lost their battle.” so why use it via TV, print, etc.? I’m on a grassroots campaign to let folks know the phrase is not appropriate. It’s time consuming but I reach out to those using the phrase in an attempt to educate them. I encourage others to do the same. I’m curious to learn what alternatives phrases you suggest when you do this outreach. As the article and so many of the comments highlight, one of the biggest challenges of the vocabulary around cancer is that there don’t seem to be many alternative phrases, so people stick with the same old words. My son, Samuel, died at the age of 2 from Langerhans Cell Histiocytosis. During his illness, we purposely avoided using words like battle and fighting. It implies competition, and, therefore, results in winners and losers. So, if someone “survives” then they have won. If someone dies, then that person has “lost.” During Samuel’s illness and treatment, we avoided using that kind of language as much as possible. I find it intimidating, not inspiring or helpful. When Samuel died, I specifically gave instructions to our priest not to mention any derivation of the words, battle, fighting, fought, loss, lost, etc. I serve on the boards of UNC’s Family Advisory Committee and the Pediatric Palliative Care Committee. What else can we do to advocate different language among the medical profession and the community of patients? We are so sorry for the loss of your son. You make some great points and we appreciate you sharing your story with our readers. We wish you all the best as you continue to advocate for patients and their families. Thank you for taking the time to respond to everyone’s comments. It is so meaningful to me personally, and validates your true and sincere compassion as a healthcare institution. People don’t like to talk about death or dying. When someone has died, we say things like “passed away” or “we lost” so and so. I think that the very idea of cancer and the instant mortality we are faced with upon our own diagnosis or the diagnosis of someone we love is terrifying – the reality of inevitable death is a powerful thing to comprehend. I think the words this article discusses, like ‘lost’ and ‘battle’, especially when describing someone who has died because of cancer or complications, are an attempt to soften the impact and not use the words ‘die’ or ‘died.’ I agree – when we use terms ‘win’ and ‘lose’ we automatically divide people with cancer into two opposing camps – and nothing could be further from the truth. You make some great points about “dividing” people with cancer — thank you so much for connecting with us and sharing your thoughts. Not trying to be controversial but surprised Dana-Farber’s response included ”loss” after Leisa mentioned her wish to avoid such words. Good point, Paul. We did not interpret her comment in that way when reading it, but sometimes even we can get stuck in a cycle of certain words and language around cancer. Thank you for pointing it out and for connecting with us. This is a tough subject. I hear all the time that I’m someone’s hero because not only did I finish my cancer treatment and am still alive but I also started a business. It’s hard to hear the word hero. I didn’t do anything except live through it! It was tough and there were many times I wasn’t anywhere near happy. When it came back I was even more scared. But you tend to just grin and bear what people say and say thank you. I know people are just trying to be nice but what I really wanted was to be treated normal. And I wish I could be normal again. I deal with it that’s all I can do. Thank you for sharing your story and your insight on this subject. Wishing you all the best. I have metastatic breast cancer. When I go to Breast Cancer walks I often wonder what to call myself. I’m not a “survivor” and yet I still feel extremely guilty. A very good friend of mine died from Leukemia after fighting myelodysplastic syndrome. She had two incredible daughters and a great husband. She was a mother, I am not. A little over a month later, my best friend’s mother dies from lung cancer. She was a mother and grandmother…again, I am not. So I ask again…..what do I call myself? Thank you for sharing your story and your thoughts on this tough subject. Wishing you all the best. My cancer journey began in 1987, when I was diagnosed with Hodgkin’s Lymphoma. Radiation brought remission later the same year. The cancer returned in less than two years. One and a half years later I was diagnosed with CLL (chronic lymphocyte leukemia). Remission from the CLL came five years later. I didn’t embrace the term “survivor” until a few years ago when: 1. I began to be diagnosed with late-effects caused directly and indirectly from the radiation therapy. Illnesses which includes heart and lung disease, kidney disease and chronic fatigue. 2. Seeking to better identify with others in the cancer community. Based on my experience I can appreciate someone not wanting to refer themselves as a cancer survivor, as well as someone who embraces the term. Thank you so much for sharing your story and for connecting with us. Wishing you all the best! My 28 year-old brother died of melanoma. My 33 year-old brother died of sarcoma. His five-year old son died of leukemia. My 70 year-old non-smoking mother died of lung cancer. They all suffered tremendously because of their diseases. Since their passing, my two sisters and I have all been treated for breast cancer. Another brother for thyroid cancer. Are we surivors? Sure, if we also want to call ourselves flu survivors. How ridiculous! Our diseases were not terminal. We have NO IDEA what our siblings, nephew, parent or anyone else claimed by cancer endured. For this reason, I would never call myself a cancer survivor, nor would they, and when someone else identifies that way, I inwardly roll my eyes. If we are still living, it’s because the disease was survivable, not because we are special. All cancers are not created equal. I think it’s a great article that asks a question, but it doesn’t seem anyone actually offered a solution. I am still looking for a more positive way to refer to it than “battling cancer” or “fighting against cancer.” Anyone out there with some ideas?